Duchess Cauliflowers - Low-Carb, So Simple! -- gluten-free, sugar-free recipes with 5 ingredients or less | Low-Carb, So Simple! These low-carb duchess cauliflowers are cousins of the classic duchess potatoes. However, they won’t be upstaged by their better-known high-carb relatives, quite the contrary: full of flavor and healthy ingredients, these morsels are also great for the finest dinner. Cook the cauliflower until soft and tender. Carefully pour out all the water. Add the salt and the butter to the hot cauliflower and purée until smooth. Add the eggs and again purée until smooth. Add the coconut flour and whisk until smooth. Let the mass stand for 10 minutes. Take a pastry bag with a large star tip and pipe rosettes or florets on the parchment paper. Bake the duchess cauliflowers for 15–40 minutes. The baking time depends on the size. The most important thing is to purée the mass as smooth as you can, especially if you are going to pipe rosettes or florets. I use hand blender for puréeing the cauliflower and switch to a wire whisk when it’s time to add the coconut flour. The better quality coconut flour you use, the better the duchess cauliflowers will taste. Good quality coconut flour is really fine and smooth, almost pure white in color and just with a hint of sweet coconut aroma, so no strong odors there. Not that good quality coconut flour will taste floury and feel gritty, so use the best quality coconut flour you can get. For the best results, you can sift in the coconut flour so that it won’t form any lumps. I have to confess that usually I’m so lazy that I just toss the coconut flour in and then mix, and I haven’t had any catastrophes. After adding the coconut flour, it’s a good idea to let the mass stand for, let’s say, 10 minutes. The coconut flour thickens the mass, and thickening takes a few minutes. If you consider the mass too runny to pipe, add a tablespoon or maximum two coconut flour. Whisk well and wait for a couple of minutes after each addition. If you don’t have pastry bag and a large star tip, you can use a freezer bag instead. Just put the mass in the bag, close the bag properly, cut the corner and pipe the mass into nice figures. Different size duchess cauliflowers take different times to bake. The tiniest ones are done in 15 minutes while the largest ones can take up to 40 minutes. In my oven the ideal baking time for medium size duchess cauliflowers is 27 minutes. The yield is then 25 pieces. I found a cheese slicer or a thin spatula to be the handiest tool for removing the duchess cauliflowers from the parchment paper after baking. Using cauliflower for replacing potatoes is nothing new in the low-carb world. However, I haven’t heard anybody making duchess cauliflowers before. Surely, there must be plenty of recipes for duchess cauliflowers out there, so if you know any, I would be delighted to hear from them. The developing of this recipe started last summer when I made my first duchess cauliflowers experiments. The results were moderate — maybe a bit too runny — so I wanted to improve the texture. From the very beginning I wanted to use coconut flour as thickener and for holding the mass together. Coconut flour simply has finer texture than for example almond flour, and for these duchess cauliflowers, everything should be smooth and fine-textured. In addition to coconut flour I needed eggs. Usually recipes for duchess potatoes call for egg yolks, but I wasn’t in the mood for separating eggs. I wanted to use whole eggs also to keep things easy and simple. Seasonings were still missing. Naturally, I added some salt. At first I also added white pepper because in my opinion it goes well with the taste of cauliflower, but then I gave up because it gave somehow too pungent flavor. So, in the end I used only salt as seasoning. The amount of the coconut flour needed the most attention. The quantity should be just right, so that the mass won’t be too runny — or too stiff. For one batch I also added some heavy cream. The resulting mass was a bit too runny (well, I poured a bit too much cream by accident…), but surprisingly enough, the ready duchess cauliflowers were quite dryish. I thought butter could give some richness to this dish, and after adding a good pat of butter to one batch the result was perfect. 1/4 teaspoon celery salt or other seasoned salt. For even richer buttery taste, you can brush the cauliflowers lightly with melted butter just before baking. My husband considers these duchess cauliflowers as great sauce carriers. So do I. Especially for this purpose I pipe tiny swirls which I serve like pasta or gnocchis. 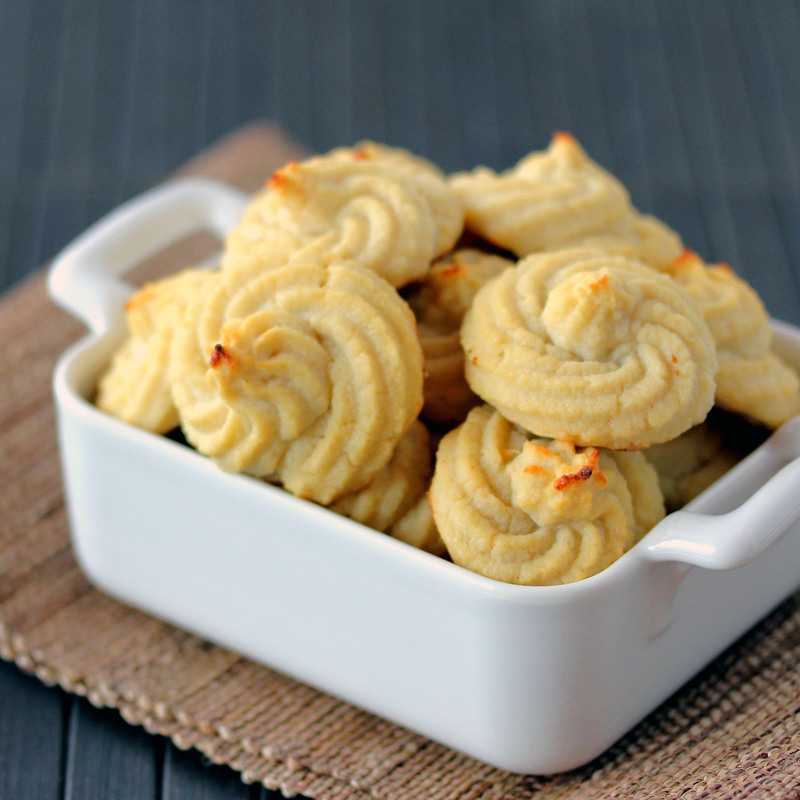 These tiny swirls need only 15 minutes baking time and the yield is approximately 200 pieces. I like them with bolognese sauce made from minced organic beef, my husband prefers them with meaty and creamy pepper sauce. I realize that this is an older posted recipe but I was wondering if you had the ingredients for the mushroom sauce! it looks amazing and I feel it would do well even with simple mashed potatoes. Hi Melissa, unfortunately I don’t have a recipe for the mushroom sauce, but I simply fry sliced or chopped mushrooms in butter until they are brown and lost all the fluid. Then I add onion powder (something like 1 teaspoon) and at least 1 cup (240 ml) heavy cream. This mixture I cook (uncovered and occasionally stirring) until the cream is reduced into a thick sauce. I season the sauce with salt and pepper and that’s it, no additional thickeners needed 🙂 Hope this helps! Thank you very much for the speedy reply!!! I cannot wait to try these out with the sauce~ I will jot the instructions down and definitely give these a try!!! Do you think it would be ok to make the mixture a day ahead of cooking? Hi Cici, sorry for the late reply (my blog has been blocking me out again…) yes, that should work well. Thank you so much, Libby! Love the work you do 🙂 People, please check Libby’s blog, it’s amazing! Do you think these would freeze well??? Hi Joan, I think I’ve frozen them and they were okay once I reheated them in the oven. They might become a bit soggy if not reheated well. I made these but they were a bit on the dry side. Defintely I would add some kind of seasoning next time as they were too bland for me. Great idea for cauliflower. what do you think of adding cheese to the batter? Hi Karen, thanks for trying out the recipe. I wonder if reducing the amount of coconut flour would also reduce the dryness, what do you think? I haven’t tried to add cheese (as far as I remember…) to the batter, but the idea sounds good. Sharp cheese might give some flavor as well. I often use garlic powder, onion powder, white pepper or nutmeg to season these. Hi Andrea! I haven’t tried, but I would expect that egg substitute works. You just need something for binding the mixture and normally eggs would do that. I wonder if you can even omit the coconut flour if you use egg substitute. Please tell me how they turned out if you try them! Hi Maryann, welcome to my blog! Hope you like my recipes! I haven’t tried to freeze these, and I’m afraid that they will turn a bit wet after freezing. However, if I tried to freeze them, I would do it after baking just because they are quite fragile before baking. My purpose is to improve still the recipe and try to make them a bit fluffier because they tend to be a bit on the heavy side. Hope you like them anyway! Thank you for this recipe, looks amazing! I am wondering, can coconut flour be substituted with rice flour? Julia, thanks for your question. I wish I could help, but I’m not that familiar with rice flour. However, if you do some experimenting, please let me know. These look amazing, I can’t wait to try them!! Thanks for posting. Thank you, hope you like them! what a great way to eat cauliflower! Thanks, Dina, for your comment! These look amazingly good! I have the pastry bag/tip so I’ll definitely try these next mashed cauliflower I want to do. Lovely! Thanks! Please let me know how you like them if you try them out! Wow, brilliant! I love the photo with the mushroom gravy and also the one of the bolognese. Really beautiful and something so different. Krista, thanks for stopping by and leaving a comment! Diana, I used a German brand called Dr. Goerg which I have found from a local grocery store. I have used Edward and Sons before, but that has been a disappointment lately. Nutiva coconut flour should be good quality flour, at least what I have heard. I haven’t tried it yet, but I will order some Nutiva flour when iHerb has the bigger package in stock.